Socks are a necessity, so why not make them fun?! With our system, you can design your very own personal pair of socks! These are great for little gifts or even stocking stuffers at Christmas. 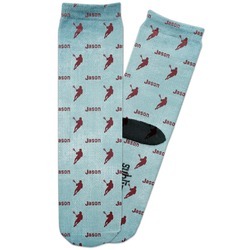 These crew socks are a great find, made of polyester and spandex. They are quite comfy! They are even USA made. They fit a Mens size of 6-8 and a Womens size of 4-8. They have a black heel as well as a logo on the bottom. They have a nice ribbed top to ensure that your sock stays on your foot. Get going in the design center to start the fun! Pick a cool pattern and even add a graphic or quote to go on top! If you have trouble just give us a call. We are always happy to help. Get a cozy outfit to go with your cozy socks. We have adorable pajama pants for men and women! The ladies should also check out our racerback tanks and leggings. All of these and more can be found in our Apparel and Accessories section. Happy shopping!